Our weekly festival season every Tuesday from June to September, with singer/producer Rachel K Collier, synth collective Marble Empire, and downtempo songwriter Alexander Carson. A one-woman electronic production machine and die-hard Ableton enthusiast, Collier is known for using a multi-instrument technical setup to enable her to perform her song-focused, high-energy studio productions in a live setting. Performing on stage together with live percussionist and interactive visuals, Collier has built and refined her live show throughout 2017 gaining significant recognition in the UK, completing a nine-date debut Tour, playing for BBC Introducing at ADE, Amsterdam, as well as a live BBC Radio session, sold-out shows at KOKO, Camden and 93 Feet East, headlining “Beats for Love” Festival in the Czech Republic and as part of Ableton “Loop” in Berlin. With a string of high profile shows line up this year including SXSW, BBC Radio 1 big weekend as well as The Great Escape – Collier will follow this up with her debut Album, set for release in Autumn 2018. Alexander Carson is a neoclassical, downtempo composer and songwriter based in London UK. Carson spent the better part of 7 years as the lead singer, and songwriter for genre-fluid quintet Wooden Arms. “Lovers” is Carson’s debut single since Wooden Arms went on Hiatus in March of 2018. The single was digitally released on May 4th on Round Table Records. Ben Fox Smith hit on a great sound early in life with Stony Sleep’s Music for Chameleons and has since spent his music career bounding from mood to mood, vibe to vibe, yet still managing to sound like himself, even when exploring forms that fall outside conventional categories. His profile has been consistently developing for a while now and his new soon-to-be released album shows the coherent leitmotif structure of his music overall despite its great diversity of harmonic manipulations. Smith’s bands (Stony Sleep, Serafin, First, Young Sawbones) have appealed to a great variety of fans: hard rock enthusiasts, classic rock lovers and jam band buffs. And while his new album, Taciturn Lanzerac, has much to offer the non-musician listener, for musicians it is a great example of how to remain musically flexible but within the framework of a coherent band sound. It is no mean accomplishment to attain this level of tonal variety in an album where it is difficult to separate the individual songs from their overall context: elements of each song’s principal mood find their way into each other even when, on occasion, Smith pulls out blustery, even wild sounds if appropriate. Smith continues to bring new resonances to the alternative rock score, both via evolving styles and via influences that had not previously made their way into his techniques. 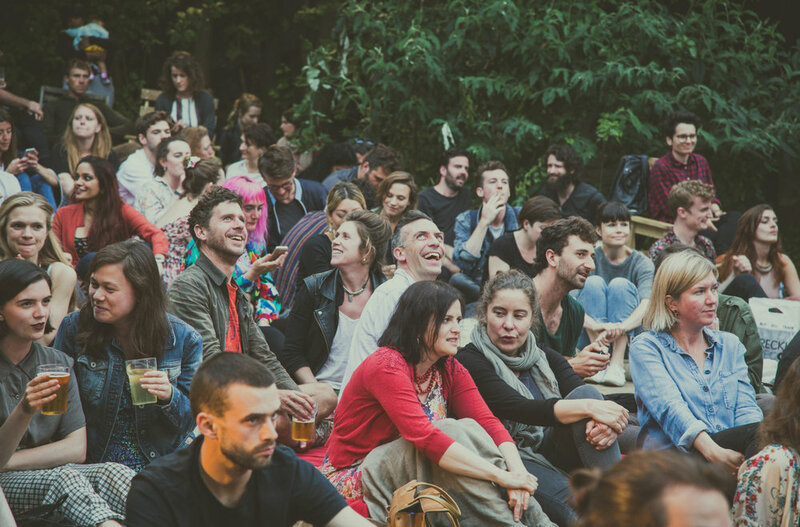 Since our first season in 2013, our event at Dalston Eastern Curve Garden has always inspired audiences in a unique and thrilling way. This season of events captures the essence of a weekend rural festival in the centre of Dalston on a Tuesday evening. The phenomenal surrounds of the garden combine with delicious pizzas from David Latto, and a supreme and ever-evolving roster of acts, to create a magical atmosphere which brings people together in a friendly and welcoming space. It's a community of music-lovers, summer-lovers and life-lovers, brought together to celebrate the warm months in a carefree and supportive atmosphere, with a compelling live soundtrack. PLEASE NOTE that this is an outdoor concert which will go ahead regardless of the weather. Please bring appropriate clothing, including waterproofs if rain is forecast.